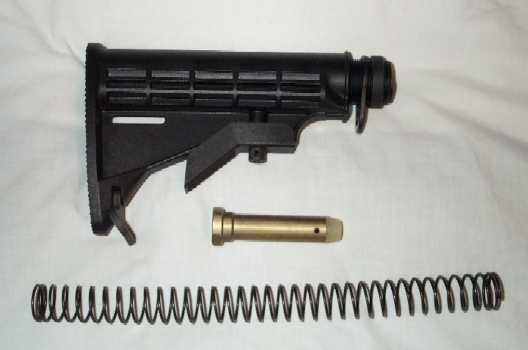 This is a new/unused six position M4 style stock, unmarked, that I purchased a while back to upgrade my "pre-ban" Colt CAR-15 SP1. However, I realized after the purchase that the existing stock is the classic Colt vinyl covered aluminum stock so I changed my mind about replacing it (it is also heavily staked in place and would be a PITA to remove). Since I live in New York, I cannot use a folding stock with any of my post-ban lowers. This stock uses the older style CAR locking ring, not the newer style castle nut, so it can be installed and removed with a standard CAR spanner wrench. $60 USPS priority mail shipping included. MO or Paypal (please add 3% for Paypal). I may be out of the Marine Corps, but the Marine Corps is in me for life.